Daled Amos: Arlene Kushner: More On Israel's Treatment of African "Refugees"
Arlene Kushner: More On Israel's Treatment of African "Refugees"
These are the legal grounds Israel has in Judea and Samaria – charges by the international community not withstanding. It is what I - and my co-chair on this effort, Jeff Daube, head of the Israel office of ZOA – are working on ever diligently with regard to the Levy Report and associated documentation. I am eager to share the URL for our website (which is up, looking splendid, but still a work in progress): We Have Legal Grounds!. Please, see it and share it! This feels like a carefully orchestrated plan to put the onus on Israel, with the PA then marching to international organizations and agencies for support. It will not do for Israel to make claims about rights in Judea and Samaria at that point. This position has to be in place prior to that. It is not enough to say, “Well, we cannot go back to the 1967 line for security reasons.” It absolutely MUST be said that we have legal grounds in Judea and Samaria. And said now. This is what our campaign is about, at its core: Defending Israel’s legal rights to the land. ”When refugees flee their homelands, they bring their wives and children along with them. Ninety percent of the infiltrators here in Israel are men. The women are also starting to trickle in, bit by bit, but in very small numbers. ”We’re talking about men between the ages of 24-45 – the working years. ”All of the African migrants I’ve spoken with have openly admitted to me that they came here to work, to improve their lives. Real refugees flee from their homeland and request refugee status as quickly as they can in a neighboring country. These people, though, have passed through four or five countries on their way here, since the nearest country wasn’t good enough. “...What we are doing now is transferring some of them to the Hulot facility, a center with amazing living conditions. You can go take a look yourself. The facility was originally built for the IDF (which was furious when it was expropriated). ”The migrants can take classes, get three square meals a day and even have full access to health services. It’s a full-service center. ”In the rest of the world, when refugees reach a neighboring country in a desperate attempt to save their lives, they are housed in refugee camps. Take a second to research this. Syrian refugees live in tin structures and tents in such camps. That’s how refugees all over the world live. If Hulot were actually a refugee camp, it would be the fanciest one in the world. ”But no, our refugees want to live in Tel Aviv. ”Because that’s where they can find work. And by the way, all of them are working. We noticed that this week, too. ”The old leaders of the infiltrators disappeared overnight, and new ones took their place. They are being briefed and handed ready-made signs. Buses are being reserved for them and they are being spoon-fed slogans. ”They’re saving the violence for the nighttime in Tel Aviv; there aren’t any cameras there. In Tel Aviv, thousands of weak Israelis have been left to fend for themselves: old people, the disabled, Holocaust survivors, the housebound, people who’ve had their whole lives taken from them, not to mention their belongings. There’s more. Read it all. You’ll learn about Israel’s liberal policies regarding infiltrators as compared to policies of other nations. 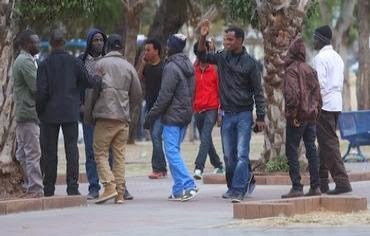 African migrants at Lewinsky Park in Tel Aviv, January 9, 2014. Photo not from original post. And keep this to refer to, and share, when you read about how horrible Israel is to the refugees. Last Wednesday, the Shin Bet released information about “an al-Qaeda plot, directed from the Gaza Strip, to carry out mega terror attacks in Israel against both US and Israeli targets,” Those targets – to be hit via twin suicide attacks - were the US Embassy in Tel Aviv and Binyanei Ha'uma – the Jerusalem Convention Center. Reportedly initiated on the direct orders of al-Qaeda head Ayman al-Zawahiri, the plot involved an Arab resident of east Jerusalem, who was to be sent to Syria for training, and a Gaza-based al-Qaeda operative, as the point man for the attacks. Two other recruits were also involved, one from a Jerusalem neighborhood; contacts were made via Skype and Facebook. 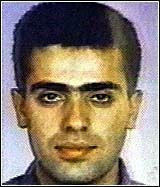 Three men have been arrested, but the Gaza-based operative is still at large. “It has also become increasingly clear, the security organization said, that the civil war in Syria, a magnet for terror operatives throughout the Middle East, has deepened the roots of al-Qaeda and other like-minded organizations in the region. “Those organizations, the Shin Bet said, are striving to link up with willing Palestinians in the West Bank and East Jerusalem in order to strike Israel and Western targets. “He claimed that the Islamic rebel groups in Syria currently focused on toppling Assad intend to turn their sites on Israel after dispatching the Syrian government. "’After Assad and after establishing or strengthening their foothold in Syria they are going to move and deflect their effort and attack Israel,’ he told The Associated Press. “...With the absence of any potential ally and any hope that a good resolution could come from the fighting, Israeli conventional wisdom has held that it was better off with it continuing and having the rival forces stay busy butchering each other rather than noticing Israel. On the very same day that the al-Qaeda plot was announced, two Palestinian Arab residents of Hevron were arrested for storing a cache of weapons in their home. We’re talking about an Uzi submachine gun, an M-16 assault rifle, a carbine rifle, hand guns and some 8,000 bullets. It is believed that these weapons were being held for terrorist attacks. I wrote last week that when Canadian Prime Minister Harper was speaking at the Knesset, there was an outburst from two Arab MKs, who subsequently stormed out, angry about Harper’s praise for Israel. One of those MKs was Ahmed Tibi, who claimed that the village, Arara, where MK Taleb Abu Arar lives, has “no water and no electricity” unlike what might be found in Syria. Members of the NGO Regavim, which fights for Jewish land rights in Israel, decided to visit that village. See the Regavim website-- and scroll down to “Another lie uncovered by Regavim,” click on it and you’ll find a video of the Tibi outburst and the visit to the village, with English subtitles. As you might well imagine, signs of electricity and more were quite apparent. Delightful. A signal lesson here: Do not believe what the Arabs say. They have no shame whatsoever with regard to telling blatant lies to suit their purposes. Obviously, it never occurred to Tibi that anyone would check. We have to expose them a whole lot more often. PM Netanyahu, in his remarks following Tibi’s outburst, commented that he never sees any Arabs would want to leave Israel (to go, for example, to Syria), and he understands this. Laughter. It is very true: They carry on about Israel’s treatment, but never take themselves elsewhere. Israeli Arabs have far, far better treatment - with full civil and human rights, and all perks of citizenship where it applies – than they would receive in any other country in the Middle East.